On the South Side of Chicago, you're only as strong as your reputation. Danny Carter and his best friend Evan earned theirs knocking over pawnshops and liquor stores, living from score to score, never thinking of tomorrow…until, in the roar of a gun blast, everything changed. Now, with all he loves on the line and nowhere to turn, Danny realizes his new life hinges on a terrible choice: How far will he go to protect his future from his past? Marcus Sakey is an award-winning advertising writer. 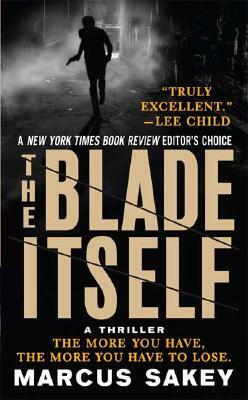 While researching "The Blade Itself" he shadowed homicide detectives, toured the morgue, and learned to pick a deadbolt in sixty seconds. Born in Flint, Michigan, he now lives in Chicago with his wife. Visit his Web site at www.MarcusSakey.com for contests, behind-the-scenes info, and an excerpt of his upcoming novel.